Global stock, bond, commodity and precious metal markets have been highly volatile since Federal Reserve Chairman Ben Bernanke again suggested that the Fed would soon cut the pace of its highly unorthodox money printing and bond buying. Gold and particularly silver had a torrid quarter and have significantly underperformed the vast majority of equity and bond markets in the quarter and in the last six months. Markets were volatile prior to Bernanke’s “jawboning”, particularly after the Bank of Japan said it would boost the monetary base by ¥60 trillion to ¥70 trillion ($600 billion or $700 billion) annually. This led to record gold prices in Japanese yen in April prior to a series of mini Nikkei crashes and gold falling sharply in all currencies. Gold prices fell 23% for the quarter, their largest quarterly fall since gold began trading in 1971. The 27% fall this year is the worst first-half performance since 1981. Silver slumped 31% in the second quarter and was down 36% in the first half. Platinum tumbled 16% in the second quarter and is down 12% year to date. Palladium fell 15% in the second quarter and is down 3.6% year to date. The global benchmark MSCI World Equity Index was down 1.2% in the second quarter but remains up 7% year to date after strong gains in the first quarter due to cheap money and hopes of a continuing global economic recovery. Wall Street’s three major indices finished the quarter with slight gains, with the Dow up 2.3%, the S&P 500 up 2.36% and the Nasdaq up 4.1%. The DJIA is just 3.2% below its record high set May 28 and up 13.8% in 2013. That is the best first-half performance for any year since the technology-stock-driven bull market of 1999 which was followed by the stock market crash of the early 2000s. The Standard & Poor’s 500-stock index rose 2.4% in the quarter and posted a first-half gain of 12.6%, the best since 1998. The Russell 2000 Index, which tracks small-company stocks often seen as closely tied to the U.S. economy, rose 2.7%. Concerns about China and other emerging markets and geopolitical unrest saw that MSCI’s broadest index of Asia-Pacific shares outside Japan down 7% for the year. The MSCI Emerging Market stock index dropped 9.1%. Bloodletting was not confined to the precious metals markets and there was considerable bloodletting in the bond market, as the yield on the U.S. Treasury 10-year note rose to 2.49% on Friday, from 1.84% on April 1 and from 1.63% on May 2, a low for the quarter. Treasuries through the iShares Barclays 20-year-plus ETF fell 8.9% in the last three months, its worst performance over the last 10 quarters. The Barclays investment grade corporate-bond index fell 3.3%. Also hit hard were emerging-market bonds, where investors were caught flat footed, not just by worries about the Fed but also by concerns about China’s economy and political unrest in Brazil, Turkey and in the Middle East. Commodities saw weakness in general with copper, corn and coffee all having deep declines in the quarter due to concerns about global economic growth. The Standard & Poor’s GSCI Spot Index of 24 commodities fell 6.7% last quarter, the most in a year. NYMEX oil had a monthly gain of 4.7% in June but still had a second-quarter fall of around 1%. Yet, it remains up 5.75% year to date. Brent crude oil sank 7.1% since March for a third quarterly decline, the longest streak in 15 years and is down 7.4% year to date. Natural gas prices declined 11% this quarter but remain up 7% this year. Copper, near its lowest price in three years, lost 10.3% in the quarter and 15% in the second half. Copper was depressed by concerns over slower growth in top consumer China and saw its third quarterly decline in a row. Year to date corn, wheat, coffee and sugar are down 22%, 15%, 16% and 13% respectively. Soybeans have eked out a 2% gain and cotton is 14% higher year to date. Part of the reason for weakness in commodities was the strength of the dollar which is the strongest currency in the world year to date. 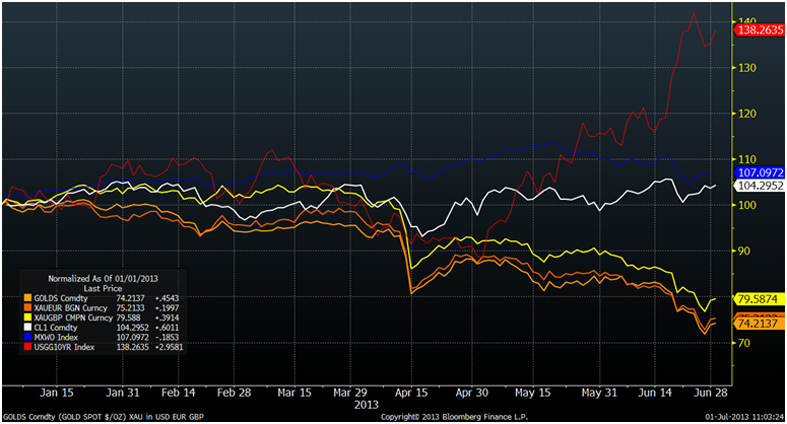 The euro, Danish krone, Swiss franc and Swedish krona have also displayed strength so far in 2013. The weakest currencies have been the precious metals, the Japanese yen, the Australian dollar and the Norwegian krone. The volatility of recent weeks is but a mere small taste of the volatility in store for all markets in the coming months and years. The global debt crisis is likely to continue for the rest of the decade as politicians and central bankers have merely delayed the day of reckoning. They have ensured that when the day of reckoning comes it will be even more painful and costly then it would have been previously. Despite a degree of irrational exuberance and complacency in markets in recent months, some of which have contributed to the fall in gold and silver prices, there remain significant risks. The global economic recovery remains very tentative. China, Japan, the U.S., the UK, most European countries and all major economies face major challenges and there is a real risk of double dip recessions and a global recession. Many western banks and sovereign nations are bordering on insolvency and remain very vulnerable. Contagion remains the real concern and there is a real risk that periphery economies are canaries in the coalmines and herald coming problems for larger industrial nations such as Japan, China, the UK and the U.S.
Should this happen long term interest rates would likely rise from the unsustainable record low levels seen today. Geopolitical risk from terrorism and war remains high and there are many geopolitical hot spots in the world especially in the Middle East – in Syria and between Iran and Israel. Tensions between Iran and Israel and the U.S. could lead to a military incident that degenerates into a regional conflict in the Middle East. Other potential flashpoints are in Afghanistan, Pakistan, the Koreas and increasing tensions between the U.S. and China and the U.S. and Russia. While there is little risk of a direct military confrontation between the U.S. and emerging superpower China, there is a risk of war being waged through proxies and of economic war involving economic protectionism and currency wars. The initial skirmishes of the ‘global currency wars’ have been seen in recent years. These currency wars involve competitive currency devaluation and currency debasement as governments and central banks internationally devalue their currencies in order to maintain job sustaining, export growth and maintain fragile economic recoveries. We are experiencing a mere lull in currency wars but expect them to return with a vengeance when economic growth falters. There will be banking and sovereign casualties in the coming years with obvious ramifications for those seeking to protect and grow wealth. Thus, it has never been more important for investors and savers internationally to have diversified portfolios. Lack of diversification and being overweight equities and property and the use of leverage and speculation led to much wealth destruction in recent years. Today, many investors and savers are overweight cash deposits and long term government bonds and are thus being recklessly conservative. This is despite the real risk of further sharp losses in government bond markets and the real and underappreciated risk of “bail-ins”. With bail-ins set to become policy in the western world, retail and corporate depositors need to be extra selective and vigilant. Owning physical gold outside the banking system becomes even more important so as to protect from deposit or asset confiscation. It is important to acknowledge the risks posed to the European Monetary Union due to a potential sovereign default still remain. Greece, Italy, Spain, Ireland and even France all remain vulnerable and the Eurozone debt crisis could rear its ugly head at any stage in the coming months. Despite Fed talk that they may ‘taper’ and reduce QE, loose monetary policies internationally are set to continue which will support the precious metals in the long term. New Bank of England governor, Mark Carney is likely to be a dovish inflationist who may debase sterling, making gold important for people in the UK looking to preserve their wealth. Sterling is already down 5% and 7% against the dollar and euro so far in 2013 and we expect further weakness in sterling in the coming months. The short term outlook for the precious metals is, as ever, uncertain. Further weakness is possible although there is strong support for gold at the $1,200/oz level from a technical and fundamental perspective. There is robust international demand for gold at these levels and gold is becoming increasingly uneconomical to mine at these depressed price levels. Pound, euro and dollar cost averaging into a physical gold position protects from volatility and from short term price risk and remains prudent. Longer term we continue to believe that gold is in a secular bull market which will continue from 2015 to 2020. We continue to believe that gold should reach and surpass its inflation adjusted high of $2,400/oz in the coming years. Given the variety of macroeconomic, systemic, geopolitical and monetary risks in the world today, owning an internationally diversified portfolio with healthy allocations to gold and silver bullion has never been more prudent.